﻿ "Asian Awareness Month has Kaleidoscope of activities." November 8, 1996. 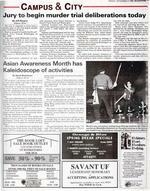 "Asian Awareness Month has Kaleidoscope of activities." November 8, 1996. FRIDAY, NOVEMBER 8, 1996,ALLIGATOR,:\rmurder deibe.rationstodayByJeffGregoryAlligator Writerhejuryisexpectedtobringback.ardicttodayinthefirst-degreemurderIofHermanE.Reed.Reedisaccusedofmurderinghisgirlend,TerryYolandaWashington,iny1995.BothsidesrestedWednesdayevening,tthejurydecidedtowaituntiltherningtohearclosingargumentsandginitsdeliberation.ssistantStateAttorneyWalterGreenidjuriesareunpredictable,butheexctsthemtobringbackaguiltyverdict.TheoverwhelmingevidenceinthisepointstoReedkillingher,"GreenId.Theprosecutioncompleteditscase with testimonyfromTanyaJohnson,afriend of bothReedandWashington.Johnson tes ifiedthatWashingtoncarnetoherapar appearing"upsetandscared"aweekeforeshedisappeared.JohnsonsaidWashingtontoldherthatReedhadthreatenedherina woodyard thesamewoodyardwhereherbodywasfoundthreeweekslater. "Shetoldmehe(drew)agunonheroutatthewood yard,"Johnsonsaid.AssistantStateAttorneyGregMcMahonsaidafter the trialthatthistestimonywascrucialbecauseitestablishedapriorsituationsimilartothecircumstancessurroundingWashington'smurder.DuringJohnson'stestimony,defenseattorneyVictorHulslanderrequestedamistrial,sayingthatJohnson'stestimonywashearsay.CircuitCourtJudgeW.O.BeauchampsaidthetestimonywasexcludedfromthehearsayrulebecauseoftheexcitedandurgentnatureofWashington'scomments.BeauchampalsodeniedthemotionbycitingtheWilliams'Rule,whichallowstestimonythatprovespriorsimilarcriminalbehavior.ThedefensecontinueditsstrategyofattackingthecredibilityofprosecutionwitnessesandportrayingWashingtonasatroubleddrugaddict.HulslandertriedtoprovethattwoinmateswhotestifiedfortheprosecutionreceiveddealsfromtheStateAttorney'sOffice.Hecalledbothinmates'attorneystothestandandquestionedthemabouttheeventsleadingtotheirclients'coopera-tionwiththestate.Bothattorneyssaidtheirclients had notreceivedanydealfromthestate.Reed'ssister,EarlyThompson, also testifiedforthedefense.ThompsonsaidthataweekbeforeWashingtondisappeared,shecamebyThompson'sapartmentandaskedReedfor$500topayoff"thedopeman. "WashingtonwaslastseenontheeveningofMay11.Reedisthelastpersonknowntohavebeenwithher.AGainesvilleemployeefoundWashington'sbodyMay23wrappedina water bedmattressnearthewoodyardbehindtheABCLiquorsstoreonSoutheastMainStreet.IfthejuryconvictsReedoffirst-degreemurder,prosecutorssaidtheywill seek a lifesentence.sian AwarenessMonthhas aleidoscope of activitiesIt'shistory.It'sart.It'sculture.It'sdying.Forcenturies,ithassteeredmantoafety.Andnowbecauseofneglect,vandalismanderosion.it'Se.ndangered.WeareTheLighthousePreservationSociety.Andwe'reworkingtopreserveour Iighthouseheritage.Since1984,we'vebeenhelpingtorestoretheselandmarks,increasepublicawareness,anddocumentandinterprettheirhistory.Andyoucanhelp.ContactTheLighthousePreservationSociety,P.O.Box736,Rockport,Massachusells01966.Orcallusat(800)727-BEAM.AndhelpusKeepItShining.SAVANTtJFLEADERSHIP HONORARYisACCEPTING APPLICATIONSOFF SUGGESTEDRETAll.. PRICEAsian-Americantheatercompanyhereandnow,Verdesaid. "ThisisagroupofAsian-AmericancollegetudentsfromSouthernCaliforniawhobringtheexperiencesofAsianAmericanstothestage,"hesaid.FacultymembersandstudentswilldiscussseveralissuesthataffectAsiansoncampus,suchastheseparationbetweenthedifferentAsiangroups,attheAsianStudent-FacultyRoundtableWednesday,Verdesaid.TheAsianKaleidoscopeincludesa film festivalthatwillfeatureavarietyofmoviesfromHongKongactionfilmstoChinesedramas,Verdesaid. "Wechosealotofthesemoviesfortheirentertainmentvalue,butwealsowantedtorepresentseveraldifferentculturesinAsia,"Verdesaid.ArchitecturejuniorChukOrsaidthesetypesofeventshelptoshowthatallpeoplearebasicallythesame,nomatterwheretheycome from. "Weareallhumans.We'reallthearne,"Orsaid. "Weshouldjuststicktogether.There'sonlyonerace thehumanrace. "%-90%5THE BOOK LOFT SALE BOOK OUTLETLOCATED INSIDEUFBOOKSTORESTHEHUBTHOUSANDS OF BOOKSONSALE OVER 1500 S. FEET OF SALE BOOKSCOMPUTERS PSYCHOLOGY POETRY CIENTIFIC SOCIOLOGY HISTORY ENGINEERING LITERATURE HEALTH TRAVEL COOKBOOKS CHILDRENSBySarahEisenhauerAlligator WriterSAVEFstudentsandfacultyhavebeeninvitedopentheirmindsandtakeanewlookatIanculturethimonth.ovemberisAsianAwarenessMonth,andeAsianStudentUnionandotherorganizanarecelebratingwiththeAsianKaleidope, amonth-longarrayofactivitiesaimedraisingawarenessabouteveryAsiancul-.reoTheAsianKaleidoscopeisdedicatedtoedu.mgtheentirecommunityaboutAsiancul r,"saidDonVerde,publicrelationsdirectorSUo"AlotofAsiansandAsianAmericansIparticipate,butwewanttoreachoutton-Asianpeopleaswell."'erdesaidstudentsshouldtrytolearnaboutIanculturebecauseofthegrowingAsianericanpopulationoncampu. sthepopulationgrows,morepeoplearengtorunintoAsiansandAsianAmericanscampus,"Verdesaid. "Itwouldbegoodto )\ abouttheirbackgroundandthewaytheyk. "'hilethereareKaleidocopeactivitiesalteverydayofthemonth,oneofthelargerntwillbeaperformanceon Nov.23bythe UNIVERSITYOFON FRI'" SAT8:00 6:00 10:00 5:00BOOKSTORESApplicationsavailableinroom314JWRUDueTODAYby4p.m. :The Lighthouse Preservation SocietyP.O.Box736Rockpol1.MA01966 (800) 727BEAM.